In this multi-part series, we will be looking at some of the laws that Governor Doug Ducey signed during the 1st Regular Session of Arizona’s 52nd Legislature. You can see Part 1: Food and Drink here. Unless otherwise stated, all laws discussed below went into effect on July 3. We will not cover all of the 278 bills signed into law, but if there is a particular bill you are interested in, please email Emily at erice@b3strategies.com and we will try to include it in an upcoming post. This post will look at new laws related to motor vehicles. HB 2135 was one of the hot topic bills during this past session. Legalizing rideshare services such as Uber and Lyft, HB 2135 was the result of extensive stakeholder meetings between the bill’s sponsor, Rep. Karen Fann (R-Prescott) and industry stakeholders including rideshare companies, taxi companies and representatives of the insurance industry. In addition to legalizing rideshare services, the bill outlines insurance and registration requirements to protect both employees and consumers. A similar bill was passed by both the House and the Senate only to be vetoed by Governor Jan Brewer in 2014. In her veto message, Governor Brewer cited concerns with consumer safety related to employees undergoing pre-employment and random drug testing and gaps in insurance coverage. The final version, HB 2135, resolved both of these concerns. An example of a “party bike” in Scottsdale, AZ. Image from the Phoenix Business Journal. Introduced by Rep. Warren Petersen (R-Gilbert), HB 2211 classifies “party bikes” as limousines. Party bikes are motorized quadricycles that are self-propelled by an emission-free electric motor and seat at least 8 passengers. The multi-seat vehicles are popular in many downtown areas, including Old Town Scottsdale. This classification allows those sitting in the back of the vehicle to consume alcohol while on the vehicle. The bill also requires party bikes to be registered with the Department of Weights and Measures, prohibits the vehicle from traveling over 15 miles per hour, and proscribes it from being driven on a highway with a posted speed of more than 35 miles per hour. HB 2236 was introduced by Rep. TJ Shope (R-Coolidge) and prohibits the driver of an all-terrain vehicle (ATV) from carrying passengers unless the ATV is equipped to carry more than one person. According to committee testimony, this bill is intended to prevent injuries to passengers who ride on ATVs that are not equipped for multiple passengers. Sponsored by Rep. Eddie Farnsworth (R-Gilbert), HB 2308 allows individuals who receive a citation for a “civil traffic moving violation” to attend defensive driving school once every twelve months, down from once every twenty-four months. Successful completion of the course will result in the dismissal of the civil traffic citation, per A.R.S. §28-3394. HB 2345, sponsored by Rep. Karen Fann (R-Prescott), allows motorcycles, ATVs and motor driven cycles to have handlebars positioned above shoulder height. Additionally, HB 2345 removes the requirement for the same vehicles to have handrails for passengers. Testimony in support of the bill stated these types of handlebars are legal in surrounding states, which has caused visitors from those states to be penalized when driving through Arizona. HB 2365 allows peace officers and other authorized state employees to enforce off-highway vehicle regulations across multiple jurisdictions. Previously, officers and other state employees were only permitted to enforce regulations on land solely under state or county jurisdiction or land that is open as indicated by federal law. Sponsored by Rep. Bob Thorpe (R-Flagstaff), the bill also modifies the definition of “off-highway vehicle” to exclude vehicles used in mining. Sponsored by Rep. Karen Fann (R-Prescott), HB 2422 removes the requirement that tow truck drivers obtain a bond before providing service. Additionally, HB 2422 changes contract agreement lengths with the Department of Public Safety. Now, if a towing firm acquires another towing firm via a contractual agreement with the Department, that contract is valid for one year after the acquisition date or until the end of the contractual agreement with the Department, whichever is shorter. Previously, the agreement was valid for one year after the date of acquisition. SB 1051, sponsored by Sen. Judy Burges (R-Sun City), statutorily defines autocycle as a three-wheeled motorcycle with “a completely enclosed seating area that is equipped with a roll cage, safety belts for each occupant and antilock brakes and that is designed to be controlled with a steering wheel and pedals.” SB 1051 also removes the requirement for autocycle operators to have a Class M license, which is required for traditional motorcycles and mopeds. Stay tuned for the next post in this multi-part series on laws passed by the 52nd Legislature. With June nearly over and Arizona’s infamous summer heat fully settled over the Valley, Arizonans have a number of reasons to celebrate the slower than normal approach of summer. After the second wettest May in state history, Arizona faced a delayed start to its fire season. Whereas fire season typically begins in May, a wet and cool spring has delayed the start of fire season weather until June. Additionally, Arizona’s monsoon season, which typically begins in July, could cut fire season even shorter. While Arizona’s fire season appears to be shorter than usual, there is no reason to expect a June without forest fires, a fact that has been illustrated by the recent Kearny River Fire. State Forester, Jeff Whitney, warned in late April that most of the state could face a severe fire season. Spring moisture caused increased growth of small plants in the undergrowth of the forest, creating more fuel once fire season begins. Increased growth coupled with Arizona’s continued drought has created a dangerous combination of factors that can lead to severe fires. Whitney noted that this year’s conditions reminded him of the years in which the 1995 Rio Fire (23,000 acres burnt) and the 2005 Cave Creek Complex Fire (243,950 acres burnt) spread. Images of Smokey the Bear postage from View Liner LTD’s website. Shifts in forest health, such as denser forests with more trees growing closer together, and Arizona’s continued drought have given rise to an era of catastrophic forest fires. These fires are typically crown fires, which burn along the tops of trees. The close proximity of the trees in many of the forests in Northern Arizona allows for rapid spread of fire, devastating tens of thousands of acres. B3 Strategies’ clients, The Nature Conservancy, Salt River Project, and Vaagen Bros. Lumber, have been active participants in treating overgrown forest acres through mechanical thinning and prescribed burns. Mechanical thinning removes small diameter trees (typically 16” in diameter and smaller) to allow larger trees more room to grow. Prescribed burns are fires purposefully set in healthier portions of the forest to reduce brush in an attempt to prevent severe wildfires during fire season. The recent release of thefinal Record of Decision for the Four Forest Restoration Initiative (4FRI), which slates 500,000 acres of forests for treatment, is another major step in improving Arizona’s forest health and preventing large scale catastrophic fires in years with more severe and longer fire seasons. While fire season is just beginning, Arizonans should be vigilant year round to protect forests from human caused fires. 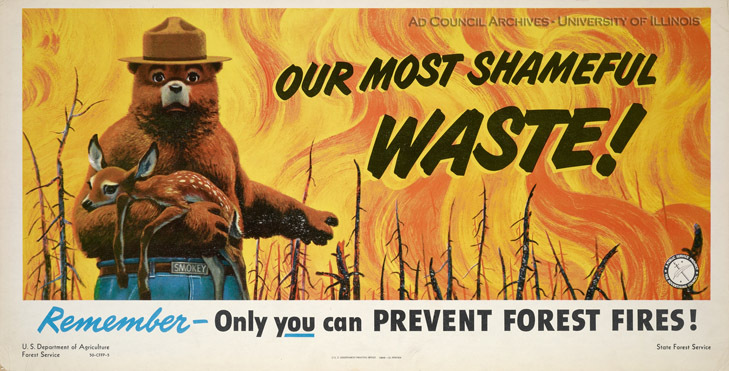 For more information on fire safety, visit www.smokeybear.com. B3 Strategies will continue to monitor Arizona’s fire season as well as 4FRI’s progress following their Record of Decision. If you have questions or would like additional information about Arizona’s forest health, please contact us at erice@b3strategies.com. Header image is from the University of Illinois Archives. The Real ID Act of 2005 was a post 9/11 attempt to “set standards for the issuance of sources of identification, such as driver’s licenses.” The ultimate goal was to improve the reliability and accuracy of state-issued identification and to make it more difficult for terrorists to utilize fake identification in an attempt to attack the United States. Per the REAL ID Act of 2005, a REAL ID compliant license must list a person’s name, date of birth, gender, driver’s license number, address, as well as a photograph, security features to prevent tampering, and a common machine-readable technology, such as bar codes and magnetic strips on credit cards. Arizona’s licenses ran into problems with the requirements as the legislature refused to permit readable technology in licenses in 2008 by passing HB 2677, fearing the Federal government could utilize the technology to track Arizona residents and that complying with the REAL ID Act would effectively implement a national identification card. How does this effect Arizonans today? Part of the REAL ID Act is a four phase plan for ending the acceptance of non-compliant licenses in certain cases. For instance in Phase 1, restricted areas in Department of Homeland Security (DHS) headquarters in Washington D.C. would only accept REAL ID compliant licenses or another form of identification, such as a United States’ passport, to gain entry. Phase 1 has been enforced since April 21, 2014. Phase 2 extended the ID requirements to all Federal facilities and nuclear power plants beginning on July 21, 2014. While these requirements did not have an effect on the average American citizen, Phase 4, set to begin on January 1, 2016, will require a REAL ID compliant license to be used to board all federally regulated aircraft. Phase 4, the final phase of REAL ID enforcement, promises to have the biggest effect on Arizonans, as well as residents of other noncompliant states. Phase 4 prompted the Arizona legislature to reconsider their 2008 bill that Arizona would not comply with REAL ID requirements. One of the last bills passed during the first session of the 52nd Legislature, HB 2609 rescinded the previous law and gave the Arizona Department of Transportation (ADOT) a path to implementing REAL ID compliant licenses. Arizonans will not be required to get a REAL ID compliant license, but they will have the option to get one. Without a REAL ID compliant license, Arizonans will not be able to board a commercial aircraft without a valid passport. Five Reasons Arizona Isn’t in a Water Crisis … Yet. On April 1, Edmund G. “Jerry” Brown Jr., the Governor of California, issued an Executive Order that acknowledged California’s drought conditions and made it impossible for any Californian to ignore the implications. California is requiring urban water usage to be cut by 25% and for water users to provide monthly reports on water usage, conservation, and enforcement on a permanent basis. From little inconveniences like having to ask for water at restaurants, to replacing 50 million square feet of lawns and ornamental turf throughout the state with more “drought tolerant landscapes,” Californians are becoming increasingly aware of how little water they really have. Founded in 1903, landowners banded together to create the Salt River Valley Water Users’ Association, following provisions of the National Reclamation Act. Individual landowners in the water service area pledged their lands as collateral to build the Theodore Roosevelt Dam. To settle the west as Theodore Roosevelt dreamed, land needed to be irrigated for habitation and agriculture. The goal of the Roosevelt Dam was to stabilize the water source of the Salt River. The dam allowed for Arizona to irrigate year round and move forward with additional agriculture projects thanks to a predictable water source. Since the dedication of the dam in March 1911, forward thinking water users at Salt River Project (SRP) have continued their efforts in creating sustainable water sources for their users in the Valley of the Sun. The creation and maintenance of six additional dams and nine canal systems keep water flowing throughout the SRP user lands. In addition to getting water to the Phoenix area, SRP also protects the watersheds that provide water to their dams and canals. From forest thinning projects across U.S. National Forests in the Salt and Verde Watersheds to researching opportunities to improve rainfall, SRP is consistently looking decades ahead to solve Arizona’s drought problems. In 1968, President Lyndon B. Johnson signed a bill approving the construction of the Central Arizona Project (CAP), a series of canals that move Arizona’s allocation of the Colorado River across the state, providing water for both irrigation and urban usage from Lake Havasu to areas south of Tucson. Construction began in 1973 and was completed 20 years later. The CAP system delivers 1.5 million acre-feet of water (an acre-foot is about the amount of water required to cover a football field with one foot of water; according to the CAP, it’s enough water to cover the needs of a family of four for one year) per year and stretches 336 miles across the state. Without the CAP system, Arizonans would have no way to move their allocation of the Colorado River south to our major metropolitan areas. In 1980, the Arizona legislature passed and Governor Bruce Babbit signed the Groundwater Management Act. The Act created the Groundwater Management Code and the Arizona Department of Water Resources to meet three goals: control severe over-drafting of groundwater, provide means to allocate the state’s groundwater to effectively meet the state’s changing needs, and augment groundwater through water supply development. The code established a program of group water rights, provisions related to new agricultural irrigation, preparation for detailed water management plans, measurement requirements for all large wells, reporting for annual water withdrawal and use, and a requirement for new land developers to demonstrate a 100-year assured water supply. These programs help ensure that Arizona protects its water resources and is prepared to provide water to match future growth. Between 2001-2005, 4% of Arizona’s water came from effluent, water that is used and then cleaned and reused for agricultural and industrial uses as well as for watering parks and golf courses. Unlike water from CAP, SRP, and groundwater, the amount of reclaimed water grows as the population grows. Arizona was one of the first states to utilize reclaimed water and as the state’s population grows, reclaimed water is likely to become a larger portion of the state’s water supply. Excess reclaimed water, un-used CAP allocations, and water from the Salt and Verde rivers are used to recharge groundwater aquifers with the goal of renewing Arizona’s groundwater resources. Recharging an aquifer is like putting money into a savings account and setting it aside to plan for future uses. To recharge, water is flooded into “porous earthen basins” and allowed to filter into the natural aquifer. Porous materials like gravel, sand, and silt act as natural purifiers so that the water, often from reclaimed sources, is clean by the time it reaches the aquifer. Arizona has been practicing water banking and underground storage since the mid-1990’s. In 1996 the Arizona Water Banking Authority (AWBA) was established to increase the state’s utilization of CAP water. For each acre-foot AWBA stores, it accrues credit that can be redeemed in the future when communities require a backup water supply. Recharging allows Arizona to store “renewable” water, water from snowmelt, rain, or rivers, to supplement groundwater resources and protect the least renewable water sources for when they are needed the most. Arizona’s water stability is the product of a century of planning and forward thinking individuals preparing for periods of severe drought. In addition to all past efforts, Arizona must continue to look ten, twenty, and thirty years into the future to secure water for later generations. While California began water planning in the last few years, Arizona has been planning since before it became a state. Despite the best planning efforts, a prolonged dry period, shortages on the Colorado River, and lower than average snowmelt can put the state in a precarious position for water resources. Continuing state efforts to utilize and reutilize reclaimed water, recharge aquifers, and protect the watersheds that provide water to the state will help Arizona avoid a severe water crisis. It is impossible to ignore the threat of drought in the middle of the desert. CEO of B3 Strategies, Russell Smoldon, has been an active participant in major water policy debates for the last three decades. B3 Strategies will continue to track water policy issues and the impact water has on Arizona’s future growth. If you have any questions or would like additional information, please contact us at erice@b3strategies.com. The Environmental Protection Agency’s (EPA) announcement of its Clean Power Plan (CPP) last June outlined state specific standards for the reduction of carbon dioxide emissions from power plants. In addition to improving air quality for overall better health conditions, decreasing health care and climate related costs are major goals the EPA hopes to achieve with the CPP. The EPA’s goal is to reduce nationwide carbon emissions 30% by 2030. Arizona’s goal, set by the EPA, is to reduce carbon emissions by 52%; it is the second largest state reduction. Power plants make up a significant portion of greenhouse gas emissions in the United States, with coal-generated power having the highest carbon emissions. In 2014, nearly 40% of Arizona’s electricity was produced by coal plants. Due to HB 2442, which passed in 2010, state agencies must receive authorization from the Arizona Legislature to create a State Implementation Plan (SIP) designed to comply with the EPA’s standards. SB 1007 was signed by Governor Ducey this legislative session and begins the process of forming a SIP, which must be submitted to the EPA by June 30, 2016. The bill calls for an analysis of the logistical and economical feasibility of reducing Arizona’s carbon emissions, and how the change in power generation will affect utilities and consumers. Failure to comply with the EPA imposed deadline would allow the EPA to craft a Federal Implementation Plan (FIP), effectively eliminating Arizona’s control in planning its carbon emissions reduction strategy, giving the majority of the decision-making power to the EPA. Prior to the announcement of the CPP, Arizona had already made changes to reduce air pollution. Utilities have looked towards solar as a means to generate “clean” power and Arizona is one of the largest solar energy producing states; however, the transition from coal to natural gas will likely be the biggest contributor in decreasing emissions. While Arizona is currently working to reduce carbon emissions, the CPP requires 80% of the state reduction goal to be met by 2020. 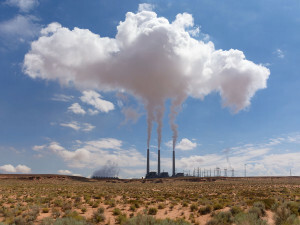 During a Bipartisan Policy Center panel, the Director of the Arizona Department of Environmental Quality, Henry Darwin, stated that, for Arizona to meet the 2020 interim check, all coal-fired generating plants would have to be completely retired. Retirement of coal will increase power costs, affecting all consumers, and also make it difficult for utilities to meet the power needs of the state, especially during peak energy use times such as summer. In January 2015, an APS representative testified that significant investment had been made to upgrade the state’s coal fire plants to meet current EPA standards, and that many of these plants still have a useful life. Effects of the CPP are significant for both utilities and consumers in Arizona. With the adaptations the EPA requires, B3 Strategies’ clients, SRP and Arizona Municipal Power Users Association, will purchase energy at higher costs than current coal-fired plants offer and it is likely the increased cost will be passed onto consumers. The EPA states that short-term power costs will increase 1-3%, but predicts an overall reduction of costs by 8% by 2030. Another major concern for Arizona is potential job loss, as coal plants are a major employer, especially in the state’s rural and tribal areas. SB 1007 analyzes the loss of jobs related to the reduction in coal use, although the EPA believes there will be an overall increase in jobs and industry. In 2004, the Apache-Sitgreaves National Forests embarked on a first-of-its-kind venture, developing the White Mountain Stewardship Project (the “Project”), a ten-year contract to thin 150,000 acres of forest, removing primarily small-diameter ponderosa pine trees that clogged the forest due to past mismanagement. The contract was awarded to Future Forests, LLC, a partnership between WB Contracting and Forest Energy Corporation. The goal of the Project was twofold: to improve forest health through thinning on a large scale and to stimulate local economic development. A variety of businesses were started in correlation with the Project, including the establishment of a high production small log saw mill in Eagar, Arizona by Vaagen Bros Lumber, Inc. While the Project was deemed a success for improving forest health in the area and stimulating the local economy, not all the acres intended to be treated were thinned and the forest products industry has struggled since the conclusion of the contract in 2014. The Project was replaced by Four Forests Restoration Initiative (4FRI), which began in 2009 and continues the work of the original stewardship project, expanding the scope of the forests to include the Kaibab, Coconino, and Tonto forests, as well as the Apache-Sitgreaves. Pioneer Associates received the original contract to thin 300,000 acres in ten years, but only succeeded in thinning 650 acres before losing the 4FRI contract to Good Earth Power in 2013. Originally, 4FRI aimed to thin 50,000 acres per year for twenty years. By July 2014, five years into the project, 4FRI had only thinned 1,772 acres. Issues with completion orders, delays in National Environmental Policy Act (NEPA) ready acres, and fires that destroyed acres slated for thinning have continued to delay 4FRI and damage Arizona’s forests. With thinning woefully behind schedule, the forest products industry that relied on Forest Service logs has begun to crumble. The Vaagen mill in Eagar, Arizona closed in October of 2014, moving to Snowflake, Arizona to support Novo Power, a renewable energy company that uses wood waste to run a 27 megawatt biomass power plant that sells energy to both APS and SRP. Novo Power President Brad Worsley told the Arizona Republic that if he had to rely solely on Forest Service logs, he would go out of business. While turning to thinning operations on private lands provides trees for some forest products businesses, the original purpose of the project, thinning 4FRI acres, has not been completed. B3 Strategies is proud to work with Vaagen Bros. Lumber and The Nature Conservancy Arizona Chapter, both of which have been strong proponents of forest thinning projects and critical to efforts so far. Unfortunately, until a company can maintain the 50,000 acre per year schedule originally intended for 4FRI’s thinning project, Arizona will not be able to reap the full breadth of the economic and environmental benefits a forest products industry based off of healthy forests could provide. Phoenix Children’s Hospital (PCH) is one of the nation’s leading pediatric hospitals and Arizona’s only free standing children’s hospital. PCH’s dedication to pediatrics extends to all branches of the hospital with doctors, nurses, and staff that specialize in pediatric care and a care outlook that focuses on the health and well being of the whole family. PCH partners with PetSmart in their Paws Can Heal program. The program encourages children to take a dog for a walk or throw the dog’s toy, increasing children’s mobility and decreasing their healing time. One PCH patient made recent headlines with “Photo Doggies for Anthony.” Anthony is a participant in the Paws Can Heal program, and his family and friends witnessed the amazing effect the therapy dogs had on his overall attitude and demeanor. However, a therapy dog was not able to visit Anthony every time he was at PCH. To help Anthony on days when therapy dogs couldn’t visit, a family friend organized a Facebook page where users could send Anthony pictures of their own dogs for him to view. To date, thousands of doggy pictures have been posted and shared with Anthony. B3 Strategies is proud to partner with PCH and help the organization inspire good deeds around the nation, even those as simple as sending a photo of your dog. If you are interested in more information about PCH’s animal assisted therapy program or think your pet has what it takes to earn national certification as a therapy dog, visit PhoenixChildrens.org. If you are looking for a different way to get your pet involved, the PCH Foundation will be hosting its annual “Dine With Your Dog” fundraising dinner and auction this April with gourmet meals for both people and their dogs. All proceeds from the evening will go to the PetSmart Paws Can Heal animal assisted therapy program. That’s a trick question, considering you are reading this on a web based blog. There are an estimated 3 billion internet users in the world, approximately 40% of the world population. In the United States, 87% of the population uses the internet. Data centers make it possible for 3 billion people to store, access, and move data around on computers, phones, smart-phones, tablets, GPS systems, and various other computerized devices that people utilize in their day to day lives. In the last few years, the Phoenix metropolitan area has become a hotbed for data center growth. A 2009 Forbes interview with Anthony Wanger introduced the ideas of Phoenix’s reliable power and low weather risks as two of the top reasons companies like JP Morgan Chase, United Airlines, Bank of America, State Farm Insurance, and Toyota have housed their data centers in the Valley of the Sun. In 2010, The Arizona Republic reported that Phoenix was attractive to the growing industry due to its “safe location and cheap and redundant power sources.” Arizona is also less prone to large natural disasters, such as earthquakes and snowstorms. Arizona’s data centers provide valuable job growth for Arizonans. This job growth happens on two fronts: direct jobs and indirect jobs. Employment at a data center is well-paid. For every “innovation job,” such as a data center job, five in-direct jobs appear in supporting service industries, according to US Berkeley Professor and economist Enrico Moretti. Jones Lang LaSalle, DCS Group estimated that a single $115 million data center facility would create 925 jobs directly, indirectly, and through construction. Phoenix is currently one of the top cities in the United States for data center growth, with nearly 30 data centers in the Phoenix area housing more than 100 companies. Data centers are crucial to the development of a 21st century economy, and are a powerful force for job development and economic growth. Additionally, data centers are able to utilize eyesore buildings, such as abandoned shopping malls, and turn them into engines of economic good, such as 365 Data Centers’ location in Park Central Mall in Phoenix. 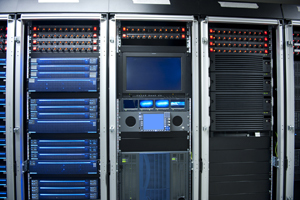 What’s more, data centers are growing. In a 2012 survey, Digital Realty Trust, through the independent company Campos Research and Analysis, found that 98% of survey respondents indicated plans to expand their data centers by 2014. With the number of internet users growing every minute, data centers will not be going away. While Arizona’s energy and weather make for an ideal development site for further data center growth, the Arizona Data Center Coalition (ADCC) felt that Arizona’s tax incentives for data center development were lacking compared to other states. In 2013, the newly formed ADCC and B3 Strategies helped pass a tax incentive for data center development and sustainable redevelopment projects. While this was a huge win for data center growth, there is more to be done as the Arizona Commerce Authority and Department of Revenue work out implementing the passed legislation. By continuing its commitment to improve its economic climate, Arizona can become one of the most ideal locations in the country to develop and grow data centers. If you’re interested in what the ADCC is doing to build Arizona into the best environment for data center growth, contact us at erice@b3strategies.com. B3 Strategies Helps Bring Barry Goldwater Back to Washington D.C. 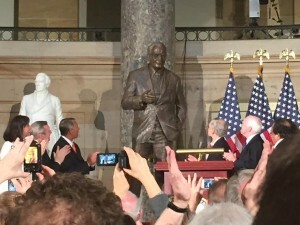 This week marked the unveiling of a statue of Senator Barry Goldwater in the National Statuary Hall in Washington D.C. The Goldwater statue joins a statue of Eusebio Kino to represent Arizona in Statuary Hall. Kino represents the days of the untamed Arizona frontier, as his explorations and cartography served to build roads and stockyards throughout Southern Arizona. Goldwater’s statue re placed a statue of John Campbell Greenway, a mining and railroad executive, which had been in the national hall since 1930. Collaboration between the Arizona State Capitol Museum Guild and the State Society of Arizona raised the funds necessary to transport the Goldwater statue to Washington D.C. and bring the Greenway statue back to Arizona. Serving as the Vice President of the State Society of Arizona, Russell Smoldon, CEO of B3 Strategies, played a role in the realization of Goldwater’s installation in Statuary Hall. Russell celebrated the installation with the State Society of Arizona, Arizona’s congressional delegation, and fellow Arizonans who flew to Washington D.C. for the event on February 11th. Senator Goldwater is often called “Mr. Arizona” and serves as a representation of the spirit and strength of the Grand Canyon State. An Arizona native, Goldwater’s family contributed to the growing economy of the new state, and he diligently served in World War II. Following the war, Goldwater viewed politics as a means to serve his home state and was elected Phoenix City Councilman in 1949. Goldwater was elected to the U.S. Senate in 1952, where he faithfully represented Arizona. After gaining popularity in the Republican Party, Goldwater received the GOP nomination for president in 1964. While he did not win the presidential election, Goldwater continued to serve as an Arizona Senator for 30 years. Goldwater’s years of service will be recognized nationally with his place in Statuary Hall. The state of Arizona is represented by two men whose contributions and efforts physically and politically shaped the state. As we look towards celebrating Statehood Day on February 14th, we can also celebrate Senator Goldwater, both his new place in Washington D.C. and his continued legacy.